Review: About Henry Hill and his friends who work their way up through the mob hierarchy. A masterpiece of film making that comes from director Martin Scorsese. A genius of a film right down to the script and the photography. This film is very long and stands in at about 2 and a half hours but well worth the watch. Based on a book by Nicholas Pileggi called “Wiseguy”. Al Pacino was offered the role of Jimmy Conway but turned it down. The main theme in this is the guilt that everybody feels. Siskel and Ebert named Goodfellas as their favorite movie of 1990. A few years ago Film Critic Barry Norman produced a list of his 100 greatest films in the Radio Times and this was in the list. At the Academy Awards in 1991 this won one Oscar and that was for Best Actor in a Supporting Role (Joe Pesci). At the Bafta Awards in 1991 the film won 5 Awards. They were for Best Screenplay – Adapted, Best Costume Design, Best Direction (Martin Scorsese), Best Editing and for Best Film. 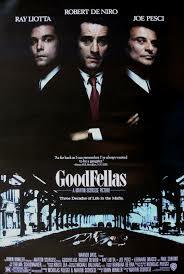 One film critic wrote “Even after 25 years, Martin Scorsese’s Goodfellas remains the very apex of mobster cinema”.